It is learnt that “Sabda Kaustubha” of Bhattoji Dikshita, Mimamsa Kaustubha of Khandadeva, Tattva- Kaustubha of Bhattoji Dikshita, Alankara Kaustubha (author is not known) are famous treasures of Kaustubha literature. 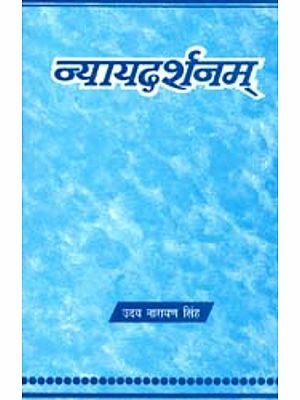 In this line another addition of Kaustubha is now being published by our Library viz., “Nyaya Kaustubha” of Mahadeva Pandita. The manuscript available in our Library is in a decaying condition and exactly 300 years old. 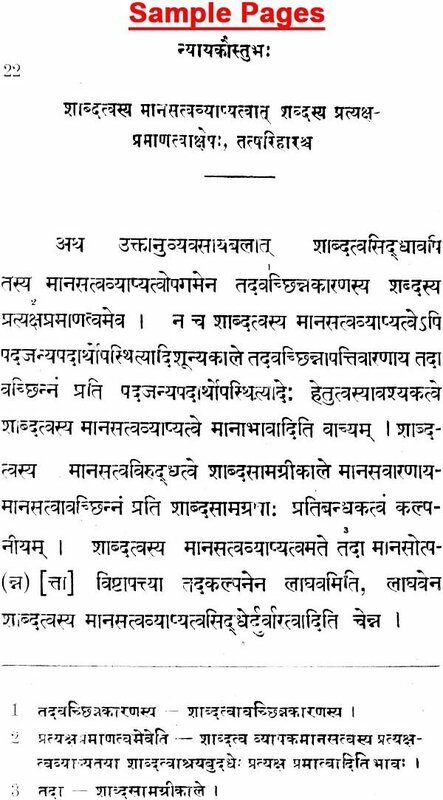 The date of the manuscript is Samvat 1839 i. e., 1782 A. D.
This work is a disquisition on the nature of Sabda and Sabdapramanya. It is a pleasure to the scholars of Nyaya to edit such great works and introduce them to the light of knowledge. 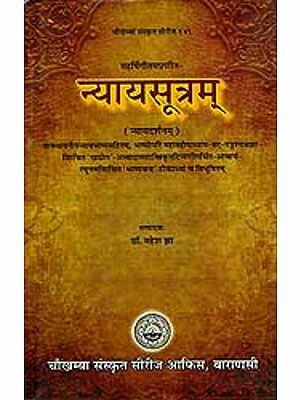 Thiru Vepattur Subramanya Sastri, recipient of the President Award for his erudition in Sanskrit, has edited this work. He is an exponent of Nyaya Sastra and an expert in explaining it. He was working as Professor of Nyaya at Annamalai University, and worked as emeritus Professor at Madras Sanskrit College and poet laureate of Kanchipuram Sankaracharya Mutt. He was honoured with the title ‘Panditaraja’ by Trivandrum Samasthanam. 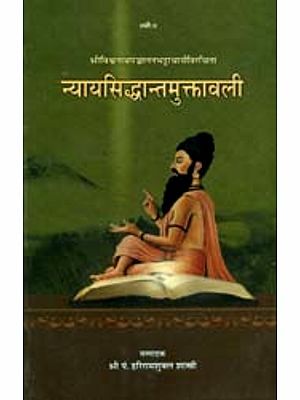 He has the credit of having many such titles for his scholarship in Sanskrit. I feel very proud of publishing this book from our Library edited by him. I thank Thiru N. Srinivasan. Sanskrit Pandit of our Library for having taken pains to spare his time to stay at Kumbakonam and correct the proofs then and there. My thanks are due to all members of the staff of the Library and to Messrs. Kumar Press, Kumbakonam for their neat execution. We also thank the Government of India for their special grant of Rupees one lakh for Sanskrit publications. NYAYA KAUSTUBHA is a learned Commentary on Sri Gangesa Upadhyaya’s Tattvacintamani in four sections (Paricchedas) like the original work, dealing with the four Pramanas, by Sri Mahadeva Pandita, son of Mukunda Pandita, The hither-to unpublished commentary on the last section entitled Sabda-paricceda has now appeared in print. Panditaraja. V. Subrahmanya Sastri has done a great service to Sanskrit scholarship by this scholarly edition of the work based on a fairly good manuscript preserved in the Sarasvati Mahal Library, Tanjavur. The present edition of the work bears ample testimony to the Editor’s mastery of the Nyaya Sastra and keen insight into other Sastras like Vyakarana and Mimamsa. 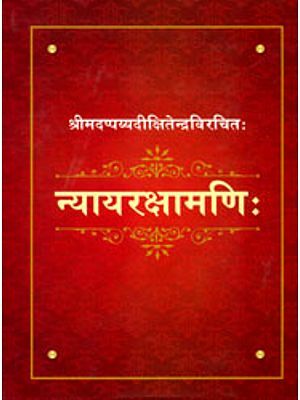 It consists of three sections 1) An illuminating Introduction (Prastavana) in 113 pages; 2) a detailed subject-wise list of contents in 64 pages and, 3) the scholarly edition of the Text of the work in 891 pages. The Introduction is at once scholarly and informative. It deals with the Origin and development of Nyaya-vidya (Anviksiki, its fundamental and pivotal place among the Vidyas, its notable writers, the emergence of the system of Navya-Nyaya with Gangesa Upadhyaya’s epoch-making work, Tattvacintamani, (13th, century, A. D.) and its commentaries and further glosses thereon by Paksadhara Misra, Gadadhara Bhatta and Mahadeva Pandita, to mention only a few of them. In these, the adverse views of grammarians (Vaiyakaranas) and new Mimamsakas pertaining to the Pramanas are reviewed and refuted. The Nyaya-Kaustubha is an excellent commentary on Gangesa’s work and the editor of its Sabda-Pariccheda has enhanced its value by 1) furnishing a list of extracts (pp.5-10) from Kaustubha cited by Sri Dharmadatta Suri (Bacca Jha) in his commentary (Gudhartha- tattvaloka) on Vyutpatti-vada, 2) citing examples to illustrate the author’s original way of interpreting the text, (pp. 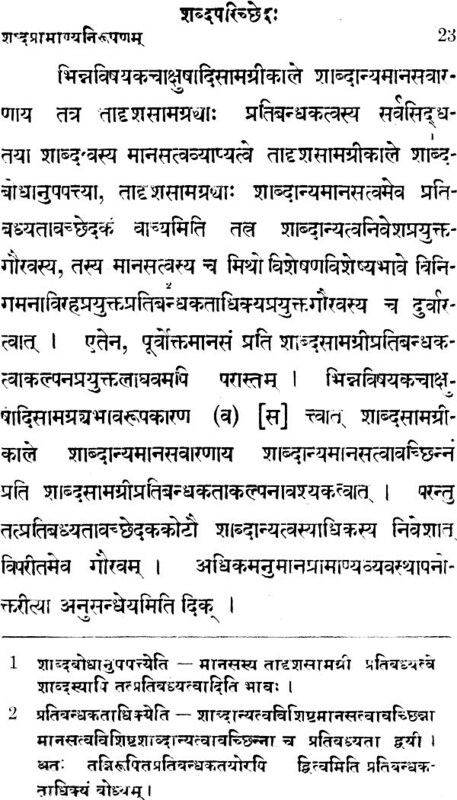 10-31), 3) giving a list of criticisms levelled against Naiyayika’s siddhanta by the Vaiyakaranas (pp. 31-46) and by the new Bhatta mimamsakas (pp. 46-52), 4) illustrating the author’s method of meeting adverse views (pp. 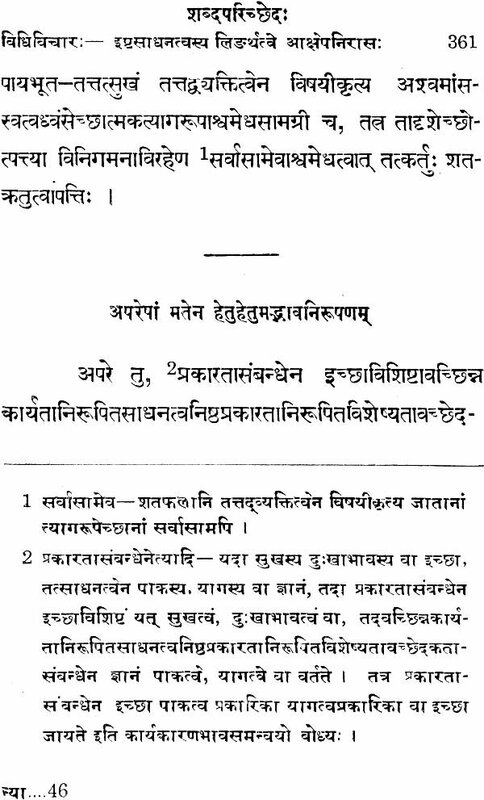 52-68), 5) giving the editor’s own elucidatory remarks on the extracts taken by the author from the works of authors on other Sastras (pp. 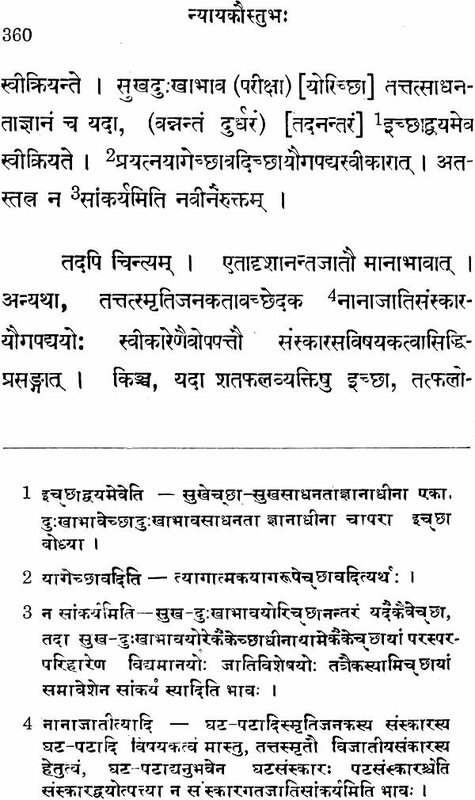 68-109) and 6) by illustrations to show the author’s versatile command of the Sastras and sincere attempts to establish the Nyaya-siddhanta. The second section (64 pages) furnishes detailed and useful subject-wise list of the contents of the work based on a critical and analytical study of the running prose-text made by the learned editor. The third and last section of the work (891 pages) is the most important and exacting one the text proper. In the task of preparing a good and readable text, the editor has pressed h mastery of Nyaya and other relevant Sastras into good service. Some lacunae (glaring omission and some superfluous (unwanted) portions of the text have been either supplied (indicated with: square brackets) or omitted (given within circular brackets) judiciously by the editor after a deep and close study of the concerned texts. 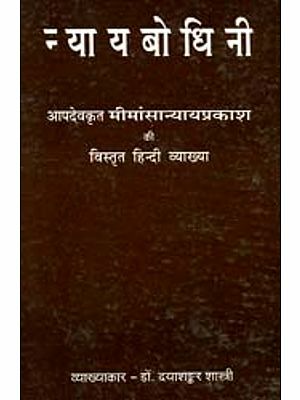 Besides being a scholarly edition of a valuable work (Nyaya-Sastra the present work is a valuable piece of research also, which is evident in the Introduction where the editor has cited passages to show that the author and Gadahara and Gadahara and Khandadeva were not familiar with each other work. He has further furnished his own Tippani (gloss) as foot-notes on the crucial and difficult portions of the original text. The Kumar Press deserves praise for the neat printing and get-up which are quite in keeping with the edition of a great and rare work on Nyaya Sastra. 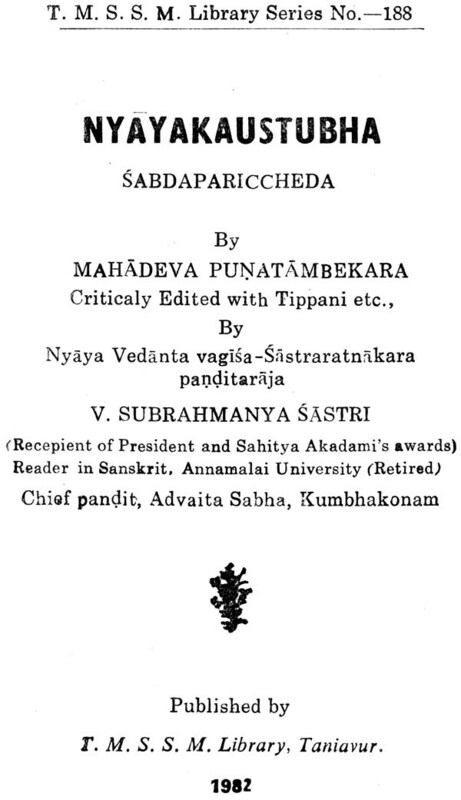 Panditaraja, V. Subrahmanya Sastri bas placed the world of discerning Sanskrit scholars under a deep debt of appreciative gratitude by this publication, for the first time, of the Sabda Paricceda of Mahadeva Pandita’s Nyaya kaustubha. May Almighty God vouchsafe to the learned editor many more years of healthy activity to continue his valuable services to Sanskrit Learning!